Award-winning publisher Archaia Entertainment, an imprint of BOOM! 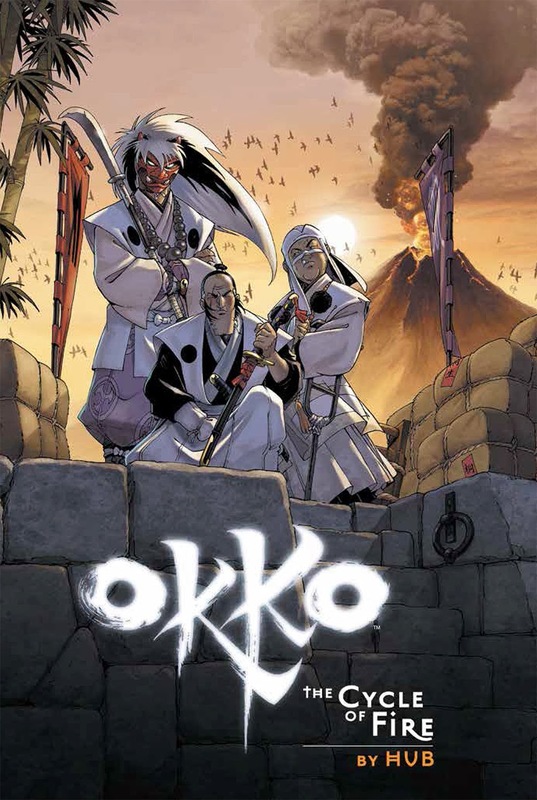 Studios, is pleased to announce the February debut of the OKKO VOLUME 4: THE CYCLE OF FIRE hardcover graphic novel. Available for the first time in English, the fourth volume of the series from writer and artist Hub continues the story of the ronin Okko and his group of demon hunters as they roam feudal Pajan. When two of Pajan’s great clans covertly agree to a marriage between their heirs to form a powerful alliance, Okko the ronin and his group of demon hunters are recruited to insure the security of the ceremony in the long-awaited fourth volume of the series that blends the fantasy and samurai genres. OKKO VOL. 4: THE CYCLE OF FIRE arrives in comic shops on February 5th with a cover price of $19.99 under Diamond order code DEC130994. Not sure where to find your nearest comic retailer? Use comicshoplocator.com or findacomicshop.com to find one! It’s also available for order directly from boom-studios.com.